The NRA misfires with their unrelenting Trump Love, as they turn a blind eye to his past, and current, positions on the right to bear arms and the rights of individuals and organizations to speak out against their government..
Bad timing, National Rifle Association. 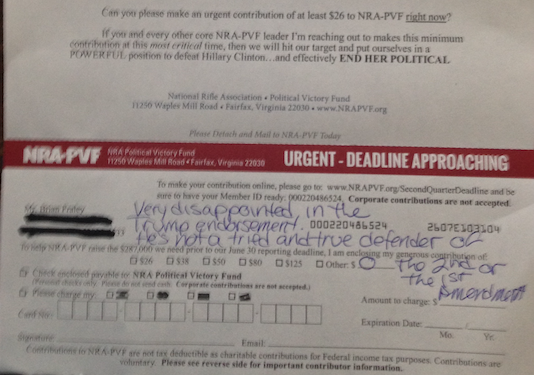 I received this urgent fundraising appeal just days after you gave Donald Trump a tongue bath at the national convention in Louisville. I understand that the NRA, the nation’s oldest civil rights organization, views Hillary Clinton as an existential threat to American’s 2nd Amendment rights. I’m not shocked that they would endorse her opponent, presumptive GOP nominee Donald Trump. His opposition to the 1st Amendment is well known. Now consider the NRA just endorsed a man who brazenly said he could shoot someone on 5th Avenue in New York and still not lose support. Just the kind of faux machismo crap law-abiding advocates of gun rights have been battling for years. Trump is the living breathing stereotype/caricature that liberals try to paint all conservatives as being. Sickeningly, it appears he was right about the 5th Avenue shooting thing. Apparently there is nothing he can threaten, no depth to which he can stoop, no position upon which he can flip, flop and flip again–that would cause him to lose support of the Trumpkins. I just never thought the NRA would so enthusiastically join his cult of personality. Ironically, this happened as I was considering upping my membership to lifetime status. Now, I’m not going to quit the organization, but I am going to sit on my wallet this year. No political giving through their organization. I’ll support pro-2nd Amendment and pro 1st Amendment politicians who are not stained with the association to Donald Trump. Judging from the reaction I’ve received on social media, many others share my concern. I guess we can just add the NRA to the list of people and organizations whose reputations are harmed by getting so chummy to Trump. It’s as disappointing as it is avoidable. Of course, Trump will be steadfast in his support of gun rights now that he has NRA’s support. He will stand by his opposition to gun-free school zones… right? The Trump Train is a train wreck waiting to happen. The credibility of the NRA is just the latest collateral damage. But he’ll totally stick to his word on Supreme Court appointments.